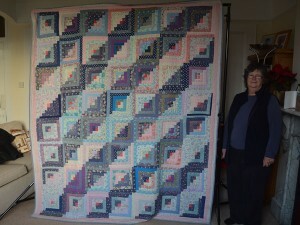 Ann’s ‘Log Cabin Straight Furrow’, quilt was started in the 1970s but took a few years to get finished. 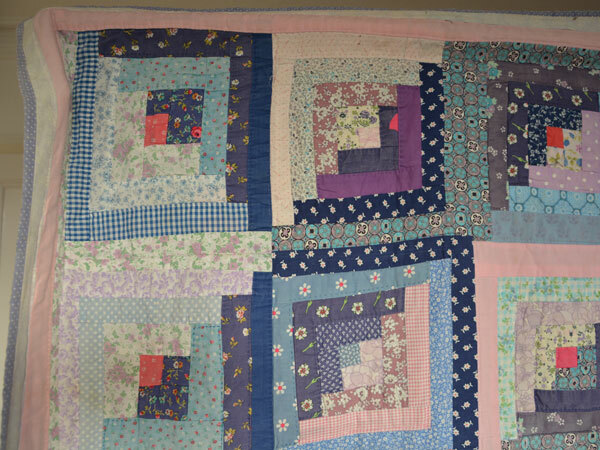 The quilt is made from scrap or cheap fabric bought at jumble sales or from family clothes; and the pattern, ‘Straight furrow’ acknowledges her agricultural home life. Ann talks about her quilting journey beginning with initially being inspired by magazines and TV programmes, then going quilt groups and how the quilt community has grown and changed over the years. Celia Jones [CJ]: Celia Jones interviewing Ann Mitchell in Lostwithiel, Cornwall on January … the 22nd, at 2:15. So, Ann, would you like to tell me about your lovely quilt, here? Ann Mitchell [AM]: I will, yes. This is the first one I made. It’s very badly-made. This was in… I started this about ’70… ’76, I think it was, and… I didn’t have any lessons, but I did see a programme on TV. And then I decided that I would do a Log Cabin quilt. And all the fabric is … well, it’s, it’s just random, really; there’s polycotton. It’s jumble sale fabric. You know, it’s all … old pyjamas. All sorts. Badly put together… but before that, I just made a lot of blocks… and then I gave up on it, and we moved. We moved farms and in the process I thought about throwing it out because it… you know, I wasn’t doin’ anything with it. And Morley said, ‘No, don’t. Don’t do that. Just put it together.’ So by that time I’d joined a small group of women that were meeting in a house in St Blazey, and we had a lady from Launceston coming to see us, called Daphne Turner. And I said to her about these blocks, and she said, ‘Just, just put them together.’ And I just … and she showed me some pictures and I decided to put it together in what they call ‘Straight Furrow’, ’cause I thought it was very apt to go with the agriculture [laughs]. So, I quilted it… as well as I could, but, as you see, it’s had a lot of wear. You know, all the kids have been… and the grandchildren have been wrapped up in it. It’s been in the washing machine I don’t know how many times. And I, I’m just fond of it, even though it’s badly made [laughs]. And the funny thing was, I saw a photograph of it. I put it in an exhibition, and I saw this photograph of it and I suddenly realized there was a huge mistake in it, and at the bottom of one of these. 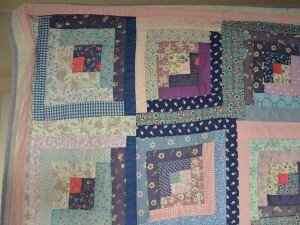 [looks at the quilt] the block was the wrong way round and it’d been like for that quite a long time. But [laughs] then afterwards I read that they call them our Humility Blocks. AM: So it’s good to have a mistake, but this was a genuine mistake [laughs]. So, yeah, that’s that one. CJ: When you say in, In The Furrow, wh-what, what are you talking about there? AM: Well, the light and the dark side of the Log Cabin. CJ: Can you explain Log Cabin to us? AM: You get this line that goes right across, and the Americans, I think, called it Straight Furrow. AM: It’s like the plough, you know. So that’s what I did. But you can see it’s got… all the fabric is quite random. CJ: Quite a few of them. AM: Oh, there’s one there. That is a nei… this was at a jumble sale, I got this, and that is a neighbour’s skirt, and I, I remember her when I look at that. AM: What was that? Oh, I can’t remember now. But, yes, they do have memories, a lot of them. And as you see, it’s… it’s faded a lot in places, and it’s also worn on the binding. So… nobody seems to want it except me now [laughs]. CJ: Did you … did you hand quilt or h-hand assemble it? CJ: You, you… s-sewed it together by hand, did you? Or did you machine it? AM: I think I machined it together. Yes, I did. Yeah, I machined it together and then I hand quilted it. Yeah. But it’s not, it’s not very true. CJ: What do you mean? AM: Well, the… it’s not very… it’s not very accurate. So I had to make… The, the individual blocks aren’t the same size. This was before the days of, mm, rulers and, and that sort of thing, and cutters and that. A-and… I didn’t realise they h-, they had to be really accurate. And actually you can see that. They’re not, it’s not accurate, but… I suppose… you know, it’s alright. Served its purpose, anyway. Kept us all warm. CJ: Ann… Can you tell me what’s in the middle of it? AM: Do you know, I can’t remember but I think it’s just an ordinary wadding. I, I… it’s, it’s nothing special, I… it’s just wadding. Polyester wadding. Yeah. CJ: And I see you’ve lined it with something. What have you…? AM: Yeah, this is bits of fabric that… you know, I had. I didn’t have enough of one, so I just… made strips of it and sewed it all together. Cut out… that was probably a sheet. 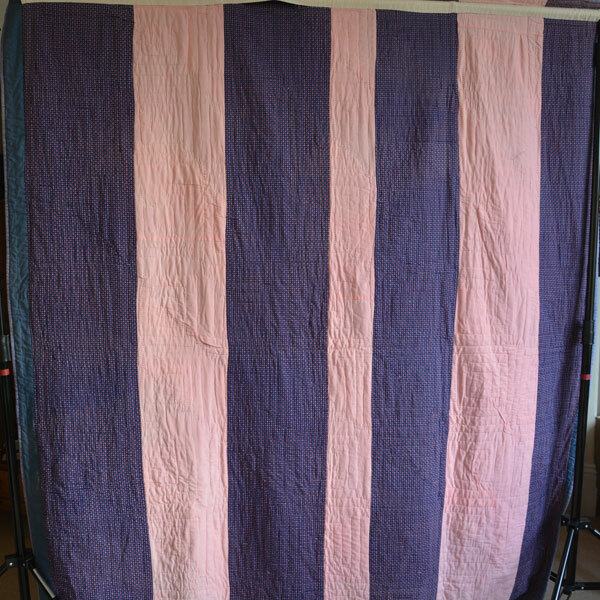 And a lot of it is now stained, but you can see that, you know, there’s, the quilting goes round it. CJ: Have you got a label on this quilt? I don’t think so. AM: Don’t think so. No, I haven’t. I should’ve done. I have labelled some of my quilts but I haven’t got one on this one… I’m afraid. I should’ve done. We were told to. It’s got a sleeve on it. CJ: And so you’ve… you’ve shown it in exhibitions and things, have you? AM: Yes, it’s been in exhibitions. Yeah. There’s the sleeve. Yeah. CJ: So, do you use this quilt now? AM: Yes, I do. I… well, yes I do for, for different things. I’ve… used it on the floor for the babies and things like that now. You know, just to… keep them clean and… We sit on it sometimes on the chair if, if … if they come in with their dirty clothes and I say, ‘Just a minute. I’ll put this down,’ and… Yeah. Actually it’s… it is a bit dirty at the moment. But in the summer I’ll put in the washing machine. AM: Oh Lord! I suppose I did. Yeah, I suppose I did [laughs]. AM: Yeah, I mean I started… I started with a bit in the middle. AM: Put those, put that bit to that bit, and that bit across there, so that made that. Then carried on putting the light and dark, and the light and the dark, so every time… it made a square. CJ: Wh-what was the inspiration for it? What was the thing that started you off? AM: With this particular one? Or… anything? CJ: Yes, with all quilting. Well, with this one in particular, yes. AM: Ah, well this, this was a bit… the first time I, I s-… wanted to quilt was I… had a magazine, I think it was ‘Woman’s Own’, and it had… a hexagon template on it, and I decided that I wanted to do this and I cut out some fabric in the hexagon shapes and put them all together. My mother said, ‘What on Earth are you doing wasting your time, cutting out bits of fabric?’ So I put it to one side. I showed it to… a cousin of mine and she said, ‘Ooh, I love that!’ And I gave it to her. It wasn’t finished. I gave it to her and then I didn’t do any. And then I saw a programme on TV, and I can’t remember… I think she was called Jenny someone, and she showed us how to do… Log Cabin, on the TV. But I think there was a book, but I didn’t have the book, and… it went from there, really. CJ: So, from there you joined a group of people. Were you all starting as new people together? AM: [talking over each other] Yes. Yes… Jill Lester put out on Radio Cornwall that she wanted to join in with a few women to do some quilting and they were to get in touch with her. So we met at her house up at St Blazey and she got in touch with mm Daphne Turner, from… Launceston, who had a shop and she made lovely quilts, and actually she was a founder member of… Flower Patch Quilters. And she used to come down all the way from Launceston, and she used to teach us every week. And that went on for about six weeks. Then we decided to form a group and, sort of asked around and people joined us, and we need to meet up at St Blazey Gate. AM: No. Th-that, that was Gate Quilters, and… I was there for a few years and then we moved farms again and, and that’s when we came up here and, we moved, we moved everything, lock, stock and barrel, and it was, you know, pretty… you know… And, I didn’t do any for a while, and then I saw an old member of Gate Quilters and she asked me if I… she’d like… If she wanted to start a new group, and would I like to join her. So we… we started Strand Quilters in Tywardreath [laughs]. CJ: So… What… How… how do you normally get your… How do you normally get your inspiration for quilting? AM: I just look at loads of books and… you know, it’s just… there, there were more programmes on TV then, and I just… We went to exhibitions and there was more fabric available, and it just went from there, really. You know, you just sort of gather momentum. CJ: Tell me about the exhibitions you’ve been to. AM: Well, there was Malvern, which we loved. We used to go up with Roslyn Coaches, and there was… No, Exeter hadn’t started then. All the group, the, the groups took off, really then, in the 80s, and we just used to around to all the groups and their group exhibitions. So… you know, it was just kind of seeing other people’s quilt, ‘Ooh, I’d like to make that,’ and… then there were more traders, and things were available, templates, cutters, you know, the… rulers and everything. It b… just became more easy to do. And quicker. And the sewing machine, of course, which… um… You know, I, I still do hand quilting and hand piecing but, you know, sometimes you want to do some in a hurry and you just get on and do the… do, get on the sewing machine and, you know, sew a few together. AM: I think… I find machine quilting very hard on the shoulders. I did a lot at one time. And then I went back to hand quilting. So… I, I suppose, you know… If it’s straight lines it’s not so bad, but doing this… v-v-…what they call Vermicelli Quilting, I… it’s really hard on your shoulders and I just… gave up on that in the end. CJ: You’ve got a lovely sense of colour, Anne. How, how do you go about selecting your fabrics? AM: I suppose it’s, over the years, you, you, you… Well, there’s more colour available. We’re lucky, really. You know, I mean… one… [sighs] The way I look at it is in one respect the fabric’s been taken over by huge business and that. But on the other side we’ve got a huge selection, and we’re lucky in that way. There, there’s more in than that, you know, where it’s produced and all that, and that’s in the back of my mind sometimes, and I, I think, ‘I really ought to go back to the way it was.’ But… you’re tempted all the time by the colour, and it’s that’s what I go for, is the colour. So, I just… You know, I just love it. CJ: What kind of designs do you like doing? AM: Really straight. I don’t do a lot of appliqué; I do straight lines, blocks, Y-you know, it’s… fairly easy blocks, really. And I, I, I’ve got this… somebody said once, and I’ve got it in my head most of the time, is, ‘Let the fabric speak.’ You know? So I, I just stick to simple blocks and you know, look at the fabric as I go. CJ: Where do you quilt, Anne? Where do you do your sewing? AM: Well, in the other room, i-in the dining room, I do. I’ve got a room upstairs but it’s so cold that I brought everything downstairs so the, I’m afraid the dining room is, is a bit of a midden at the moment, but we don’t go in there very much except me [laughs]. CJ: Do you sew when you’re with other people then? When you go … t-to groups? AM: Yeah. Yes. Yes, I do. Yeah. CJ: What do you get from going to the groups? AM: It’s just a… the, the laugh, the companionship, the, the, the common interest that you’ve got something to talk about… instead of… just sitting there gossiping. I mean, we do gossip. Yeah, we do, but it’s different. You’ve got this… thing that you’re making, and… It’s hard to explain it really but I just… I, I don’t know. It’s, it’s like… Yeah, like I say, a common interest. CJ: And do you learn from one another? AM: Ooh, yes. Yeah, you do. Yeah. Um… Yeah, you do [laughs]. CJ: How many quilts have you made, Ann? AM: Oh gosh! [sniffs] Um… Well, I’ve, I’ve got those. There’s, there’s a… a couple of dozen there. And I, and I’ve made for the Linus Project, which is security blankets for… um… under-privileged children, and sick children in hospitals, and things like that. So I’ve… we, we did a lot at one time. I’ve made quilts for Albania, and they were taken out by a lady from Launceston. And I’ve made one and put, put the little boy’s name on it. I can’t remember his name now. And I had a photograph back of him with the, with the quilt round it. And the sad thing was that the, the lady that took it, she said that is the only possession he probably will ever have. You know, it’s so sad. That was years ago when they had all that trouble out in Albania. You know, we just… we did things for the Mermaid Appeal and, for the baby unit. I had a, a granddaughter – she was premature – and, I made her a little quilt, and the staff saw it and asked me to make a few… for the beds, for the, for the cots, for the s… in the… baby unit. So, yeah. CJ: So you, you’ve done a lot for different charities as well as … presumably, for your own family? CJ: What do they make of them? CJ: And, and you carried on making them for the next generations down? AM: I made for my youngest granddaughter. She’s, she’s nearly 14. And we made some together as well. So they’ve all had them. They’ve all had quilts. So there’s… seven, seven grandchildren and five of them are girls. So they’ve all had… And Sam had one as well. Ollie, I gave him one year ago. I don’t know what happened to that but I’ve got photographs of them, so… [laughs]. CJ: And the next generation down from that? AM: Yes, I’ve made two for the, the, great-grandsons. I’ve made… they’re twins, and I’ve made one each for them. They’re only a year old, so no doubt I’ll be making some bigger ones. Yeah. CJ: Do you… use books or magazines or anything to help you? AM: Yeah, I do. A lot. And the patterns. You know, the, a lot of them, like, ‘Quilt Mania’ and that, they’ve got some… paper patterns in them which you can use and… Oh yeah, I always use the books, yeah. CJ: But you don’t copy them straight? You adapt them, do you, or…? AM: Yes. Yeah, well yes. And the thing is that you’re using different colours and different fabrics, so they will look a bit different anyway. And you can… you know, you can make them different. CJ: So, can you tell me about any difficulties you’ve met quilting? CJ: Well, difficulties with assembling things or, or… in designing, or… anything at all. Any problems that it’s given you? Or in machines or…? AM: N-no, I haven’t really. I’ve… If, if I’ve got problems then I’ll ask someone and… you know, we’ll sort of do it together and work it out, and… We share the knowledge. CJ: You share the knowledge. CJ: When it comes to… putting a big quilt together, how do you manage that, the actual… assembling it? CJ: So that’s all helping together, to m… to help pe-, people put their quilts together? AM: Yeah. You get four people or more on… each side of the tables and they stretch it and… pin it, and then you tack it and… Yeah, you take it home [laughs]. CJ: Why is quilt-making important to you? Well… I… it’s, it’s… it’s just creative and… I just wanted to do it. I j… I-it… I liked the colours. It’s just something that you feel you’ve achieved. You… you start off with a pile of fabrics and then when you’ve finished you’ve got, you’ve got an item. You know, it’s… it’s, it’s strange really that, you know, a, a sort of a bag of fabric and bits and pieces, you can turn into that. Yeah. CJ: Have you seen any really old quilts anywhere? I m… been to exhibitions to see those? And what do you make of… quilting in the past? AM: I’ve been up to Wales; there’s a lovely… There’s a lovely place called the Minerva Centre, and I’ve seen old quilts there, in the… The strange thing I found was that the Welsh quilts… are very like the Amish quilts, and you, and you do wonder… how it… it, the influence of quilts all round the world, you know, how it, how it travelled. And of course, everybody sort of went from country to country. And I suppose the women needed bed clothes and things like that for their, for their beds and that, and that’s what they did. And it’s an outlet, isn’t it? It’s hard to explain it. But we seem to want to do it! You know, it’s like the… woman from Gees Bend, those quilts. AM: Gees Bend in Alabama. They were … ex-slaves and, and they made all these quilts, bit like this. Not… Some look badly made, but they’ve got a charm to it that you really want to look at them. You know, it’s not just a repeated pattern it’s a wobbly strip of fabric, but they’ve made it… s… They’ve sewn it to another wobbly strip, and they’ve made the whole quilt like that. And… You know, they’ve, they’ve… they haven’t been afraid of criticism. ‘Oh, ooh, that’s… that’s not very good sewing,’ and things like… They’ve done it! And that’s what I like about them. They’re spontaneous, they’re… You know? That sort of thing. Mm. CJ: So… from what you’re saying, you’re indicating that you, you choose a very individual approach, rather than wanting to make something that’s… looks as though it’s machined, a sort of, an item for sale that you want to… a hand-produced item. AM: I do. I do really. I, I don’t want it to look manufactured. I just want it to be… looked used and that’s why I, I put them in the washing machine and, and they wash very well and that, and that’s why I do it really, all these little bits… Because the smaller the bit of fabric, the more I like it [laughs]. And that’s why I do these half square triangles because… well, you know, you’ve got a lovely piece of fabric. And you always wonder, when you see that piece of fabric, what the rest of the fabric was like. CJ: I’m sorry, I don’t know what you mean by half square triangle? CJ: Wow. Are you going to carry on quilting? CJ: So … you started that Chris-… quilt at Christmas; how long do you think you’ll be working on it? AM: Well, I, I’ll do the top probably. I’ve finished the top. And then… it’s quite likely I might start another one and then go back, because I’ve got one already that I haven’t put together in, in layers. And I’ve got, I’ve got to do that. I’ll get some wadding and I’ll do it like that. CJ: So which bit… you, you sound to me as though you enjoy the, the piecing, the putting together the fabrics more than the quilting. AM: Yes, I think I do. Yes. Because you’re making a pattern. And I don’t like a lot of, involved quilting, really. I have done it in the past over some of them, but if you start on a block and you do a lot of quilting, you’ve got to repeat that … over the whole quilt and that can get a bit tedious sometimes. CJ: So what style of quilting do you actually prefer then? AM: I like outline quilting, quarter of an inch outline quilting and straight lines and … that type of thing. That’s what I do mostly now. Yeah. CJ: So, h… I’m not sure what you mean by outline quilting. AM: Well, this… Well, this is it, really. I mean, this, this is… this isn’t the traditional way; it’s a quarter of an inch usually, but as you see I’ve got fairly near the… sewing line. But that’s what it is. You outline the strip or the shape a quarter of an inch, and then you just… go round it. Just keep it in place. CJ: And do you, do you do your quilting by hand then? AM: Yes. Most of it. Yeah [chuckles]. Well, it’s nice to have … If it’s a small quilt, I’ve got something to take with me to the group. You know, i-if it’s too big then y-you can’t really. Yeah. CJ: Thank you very much, Ann. Thank you for answering the questions [laughs]. AM: Thank you [laughs]. It’s been a pleasure [laughs]. CJ: This is Celia Jones continuing with Ann Mitchell. Ann, can you, can you tell me about this? CJ: And no duplicates at all? They don’t find a double? AM: They don’t find a double. They shouldn’t do [laughs]. AM: And, and this one is a, a Japanese… the fabric itself is actually Japanese fabric, and I love Japanese quilts. And I love the, the work that they put into them. But that, that’s all traditional Japanese fabric. CJ: This is Celia Jones continuing with Ann Mitchell. AM: And this is a Japanese type quilt which is made from a genuine Japanese fabric, and the, the pattern isn’t actually a traditional Japanese pattern, but… I made it as simple as possible and all the fabrics came from Japan. CJ: Can you explain the pattern to us? AM: Well, it’s just a square with a border and then another square with an appliqued circled on the top. And… they were all, they’re all different as well, or mostly different. And they’re different types as well. That, this is printed pattern and this is indigo. And I just love Japanese fabrics and their patterns.